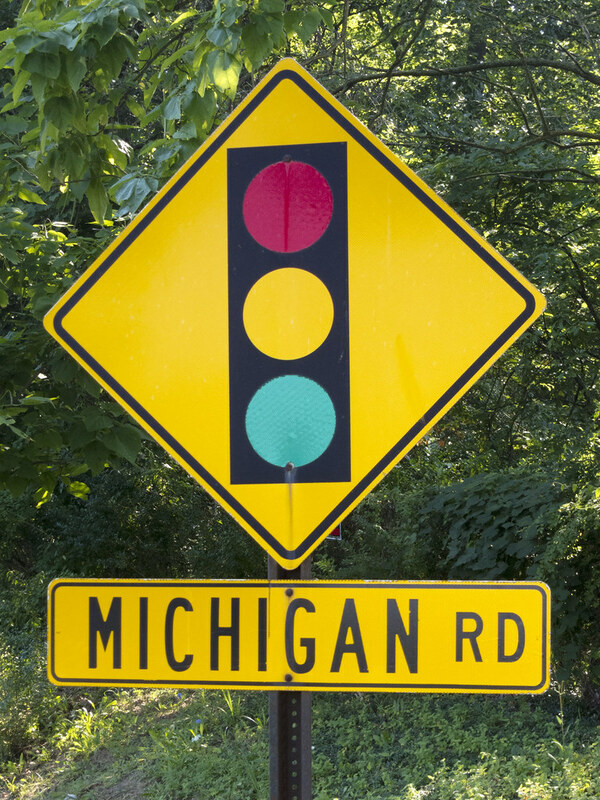 I wish I had started photographing the Michigan Road near my home as soon as I moved to the area in 1995. So much has changed. It would be interesting to have photographs that show the evolution. But I only started photographing the Michigan Road in 2008 after a lot had already changed. And then I never could have predicted some of the changes that have come. 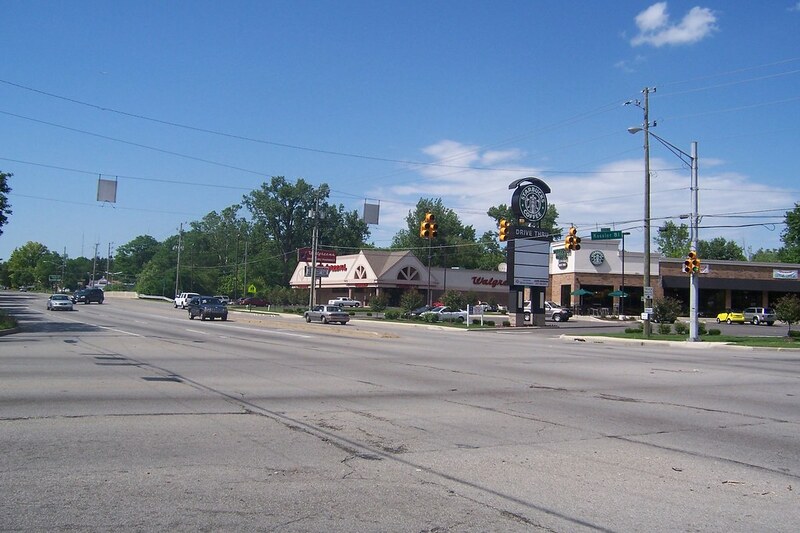 I live near Michigan Road’s intersection with Kessler Boulevard on Indianapolis’s Northwestside. 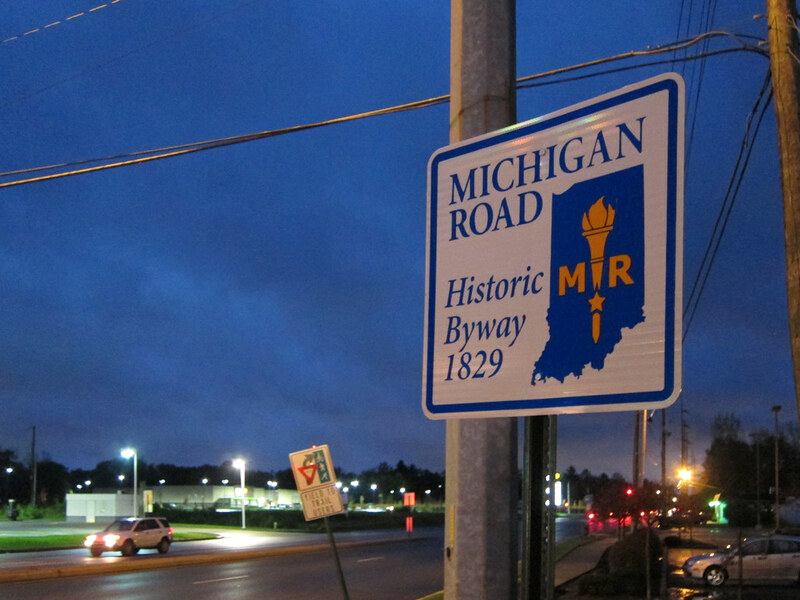 Michigan Road is the Michigan Road, built in the 1830s to connect the Ohio River to Indianapolis to Lake Michigan. 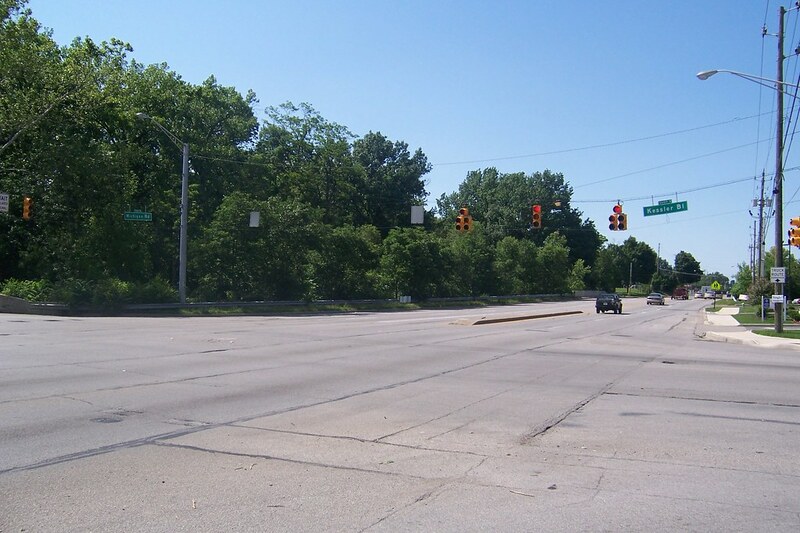 Kessler Boulevard itself has an important place in Indianapolis road history as an early but unfinished attempt at a beltway around the city. In 2013 when the Historic Michigan Road Association erected wayfinding signs along the Michigan Road Historic Byway, I personally donated funds to ensure signs would be placed at Kessler Boulevard. Over the last 20 years or so, commercial structures have been replaced and some land has been cleared to build new commercial structures. That happens all the time on any major road. But this is the major road I live nearest. These changes affect my everyday life. Here’s a 2017 aerial image of the intersection, courtesy MapIndy. 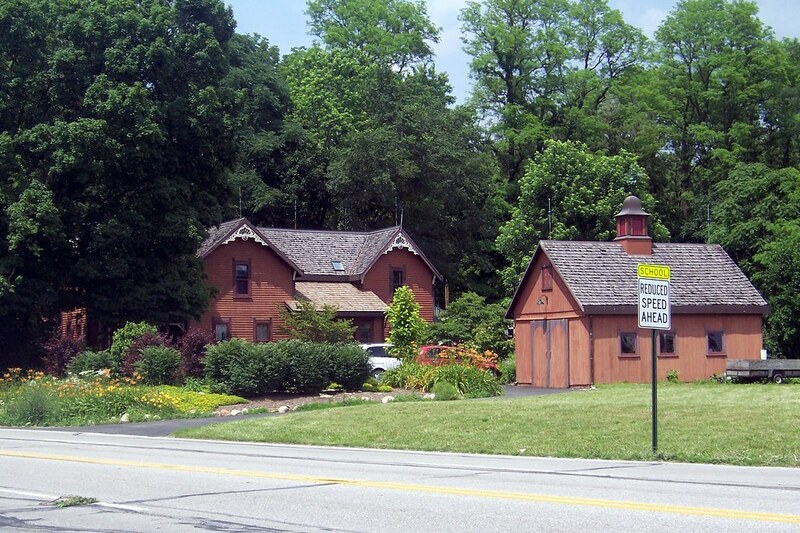 On the northwest corner is Crooked Creek School, which has been there since 1837. On the northeast corner is a Starbucks; behind it is a Walgreens. On the southeast corner is a gas station and a McDonald’s; a Walmart Neighborhood Market is to its south. And on the southwest corner is a building with a fried-fish joint and a physical-therapy office, and a car repair garage. The first change was on the southwest corner. Crooked Creed flows close to the road here, creating a narrow wedge of a lot. When I moved to the area in 1995, the Gillum family operated a large and popular produce stand on it from spring to autumn. 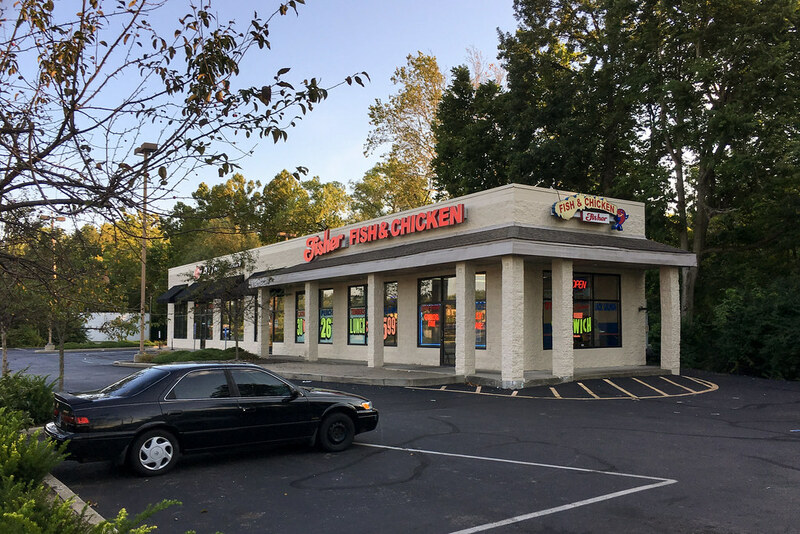 In the late 1990s they built a building on the site and operated their stand all year, adding a deli counter and high-quality and organic grocery items. While I applauded their attempt and stopped in frequently, the store failed within a couple years. I don’t know the real story, but I assume that this middle-class neighborhood couldn’t support Gillum’s quality goods and associated high prices. I wonder also if the lot’s awkward access hurt the business — its’ challenging to turn left off Michigan into the lot, or left out of the lot onto Michigan. The building stood vacant for a long time before it was reconfigured and a Dunkin’ Donuts moved into its south half. Fisher’s Fish and Chicken later moved into the north half. Dunkin’ Donuts didn’t make it (despite my near-daily patronage!) and later a physical-therapy office moved in. Here’s how the site looks in 2017. 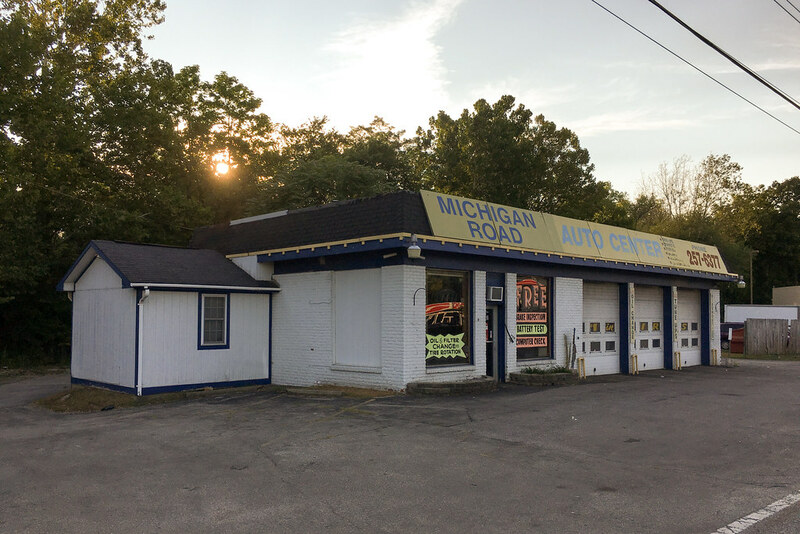 Its neighbor to the south, the Michigan Road Auto Center, has been steadily serving customers the whole time I’ve lived here. They’ve had a front-row seat to all of these changes! 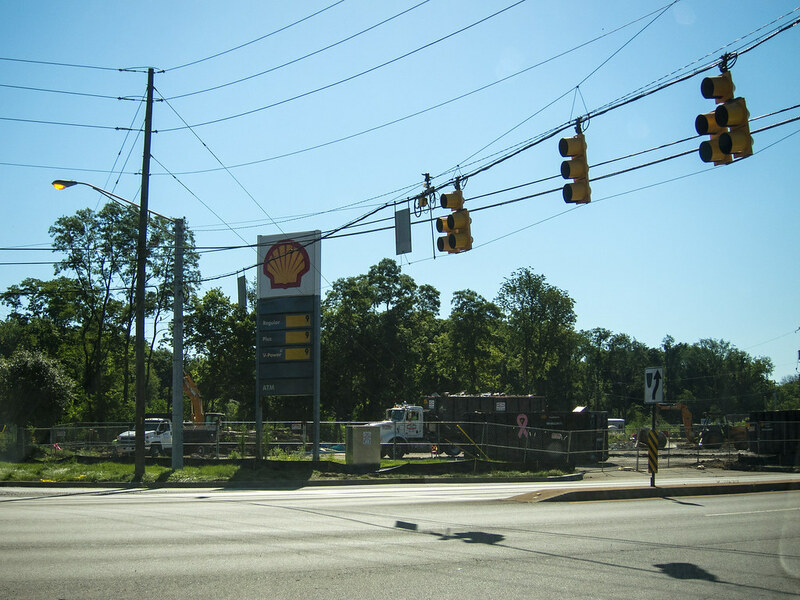 The second change was the Amoco/BP station on the northeast corner was razed so that a Starbucks could be built. It’s been there for quite some time now, as my 2008 photo shows. Little has changed on the northwest corner — Crooked Creek School isn’t going anywhere. 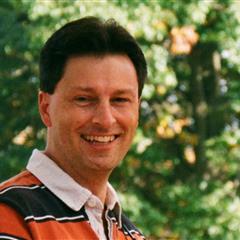 The first photo below is from 2008. 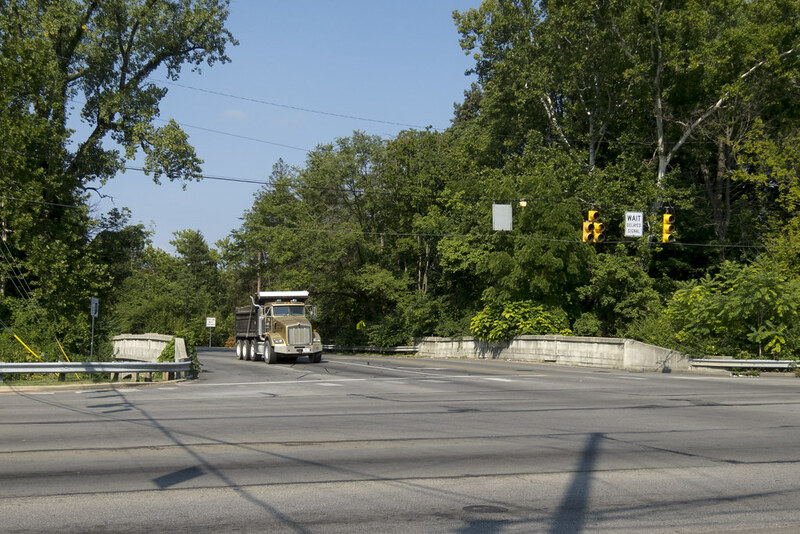 The second photo, from 2017, shows the 1924 concrete-arch bridge on Kessler Boulevard over Crooked Creek. The third photo shows the new pedestrian trail the city built along Michigan Road where it passes by the school property. Things have changed the most in this intersection’s southeast quadrant. For years, it was large wooded area next to a large lot with an abandoned-looking one-story brick building. 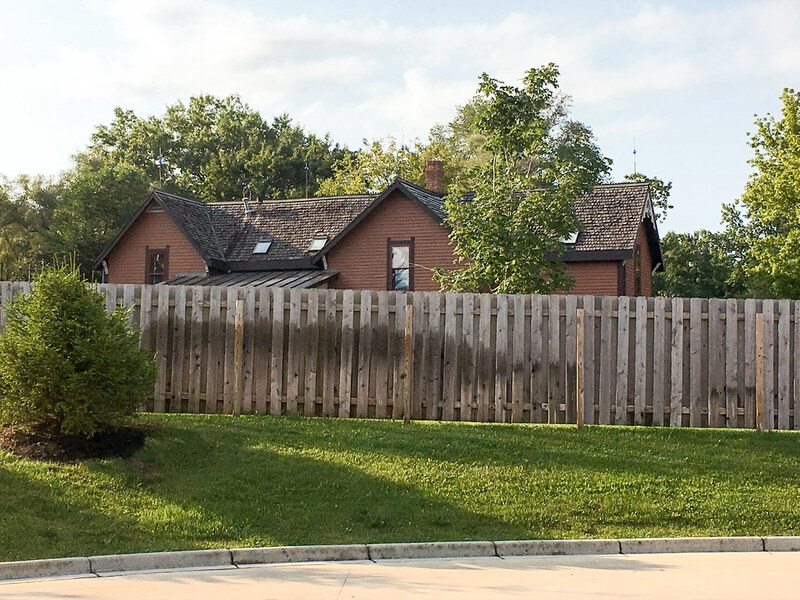 I never photographed the building, but an old house faced the street in the wooded area. This McDonald’s stands in about this location today. 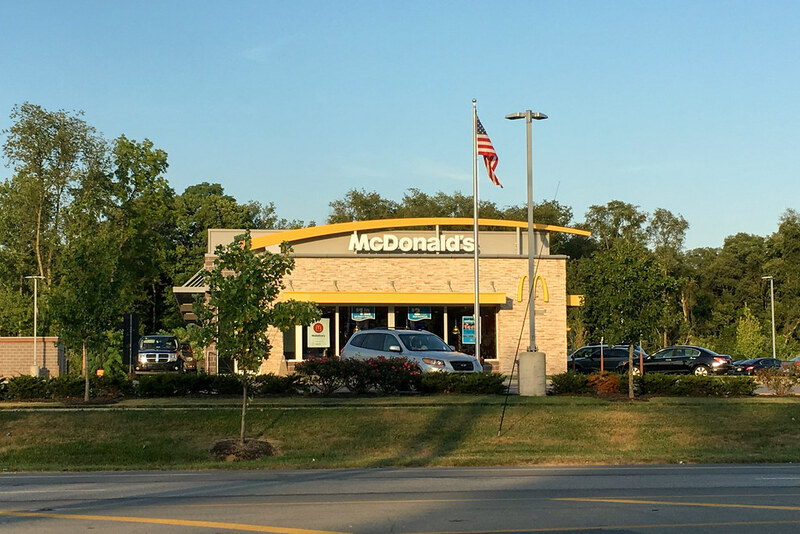 The McDonald’s came after a Walmart Neighborhood Market was built on part of the wooded lot and where the brick building used to be. 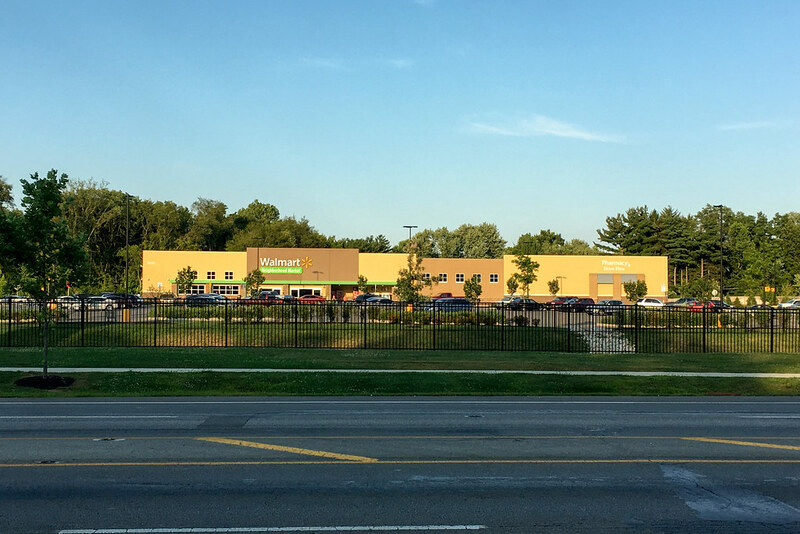 While I’m not a giant Walmart fan and would have been happier with a Kroger, having a grocery store here at all has been a giant blessing and has made this part of town a lot more livable. That great old house wasn’t demolished, thank goodness. It was moved to the end of a dead-end street that borders the Walmart property. Here it is behind Walmart’s fence. I lifted my camera up over the fence to get this shot of the back of the property. As you can see, even the outbuildings were moved. 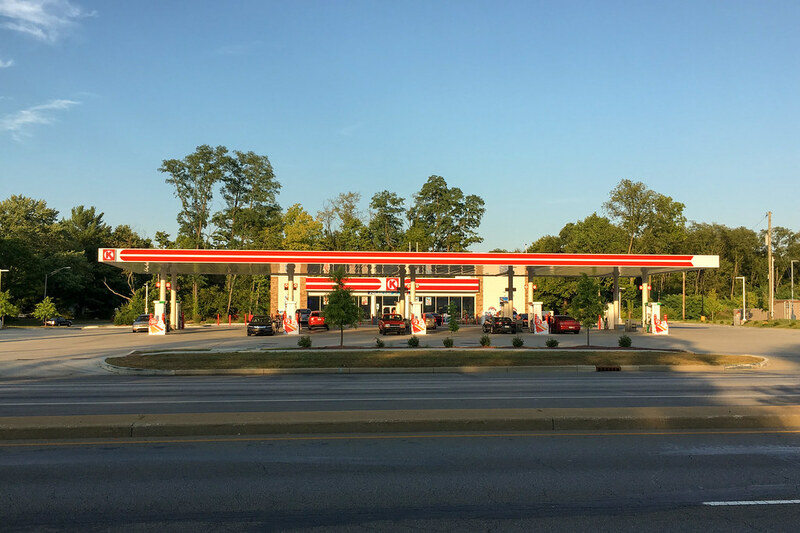 Completing this intersection’s transition, a Shell station built in the 80s was razed in favor of a new, larger convenience store and gas station. 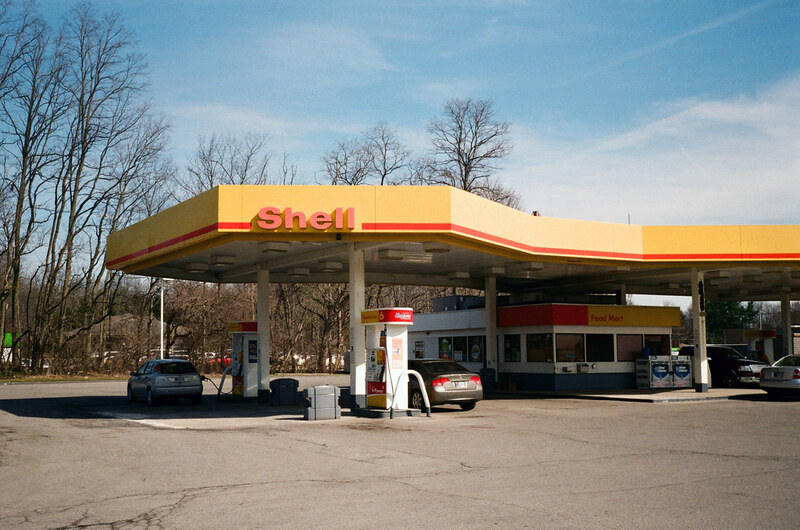 This was one of the few Shell stations remaining in the area with this style of canopy, and I was sad to see it go. But it really is nice to have a full-scale convenience store here now. Frankly, the section of Michigan Road from Kessler north a couple miles to just past 71st St. is pretty depressed. When Walmart went in I hoped it would encourage a rebirth north of Kessler, but so far little has changed. I’ll share some photos in an upcoming post. You are jogging my memory of an area that I have been through only occasionally through the years. I remember the produce stand. I am thinking that there was a little BBQ joint right around there but it may predate you. You have me thinking about the commercial corridor nearest me and how much turnover it has experienced as well. It’s been fascinating to watch this corner change so much in 23 years. I wish very much that I had photographed the entire Michigan Road corridor as it was when I moved here in 1994. North of 71st the road was still just two lanes wide then! I remember the mile-long backups northbound as everybody had to merge down. I wonder if your photography has contributed to an increased awareness of the changes in your neighborhood? It has. Photography has helped me to notice and see things I never did before. I met a lawyer not long ago that had a pretty big house in the that area built decades ago. Many of the neighborhoods on both sides of Michigan seem sort of run down now, but apparently 30-40 years ago or so, there was relatively little there and some fairly well-to-do people built larger homes in the area on very large lots, which then sort of got surrounded by cheaper homes as the years went by, as well as what we would refer to (up north) as “suburban rentals” (i.e.those cheaply built, two story, drive around and park in front of apartment complexes). Someone at the Pike library told me that in the 70’s much of the area around 62nd and Zionsville was still horse farms and open property. Hard to believe. I’m over 60, and a lot of neighborhoods I grew up in 50 years ago in Milwaukee and Chicago, in the city, look relatively the same today except for a change of what’s in the stores. I’m glad you explained that Kessler was supposed to be a “loop” road, I could never figure out why it actually went in two directions, you’d be driving down 56th, and all of a sudden you were on Kessler? This parallels Highway 100 in Milwaukee, which loops the city, and was Good Hope road on the north, 108th street on the west, and Rawson avenue on the south, but always Highway 100! Now if someone could tell me who owns the arts and crafts prairie-style house on 50th and Michigan (and how it got there), we’d be set! I know a fellow who grew up in Pike Twp. near 62nd and Zionsville. He’s retired now and very much remembers when it was all farms out there. I arrived here in 1994 and started in Pike Twp, and remember that it was much more farmland then than it is now. Pike was in quite a building boom in the 90s. I tried to keep Gillums open when they had that building built. I made it a point to ask how business was doing every time I went in for one of their massive sandwiches. At the very end, a worker told me “we should’ve stayed just a fruit stand”. The Dunkin Donuts there had atrocious service. I had a hunch it’d fail quickly and it did. The barbeque place was Sams Hickory Bar-B-Q and it lasted a long time. Before that it was a Burger Chef. The shell station was built in about ’85. We would ride our bikes from Wolfington- Northern Estates all the way there just to get a snack. Big thrill. LOL. For about 10 years prior to that it sat as an abondoned independant gas station. The Walgreens replaced a McDonalds in the early 90’s or so. It was the only Mcdonalds I’ve ever seen that failed. There was a robbery in there in the mid 80’s where an employee or employees were forced into the freezer & shot — I think they died. 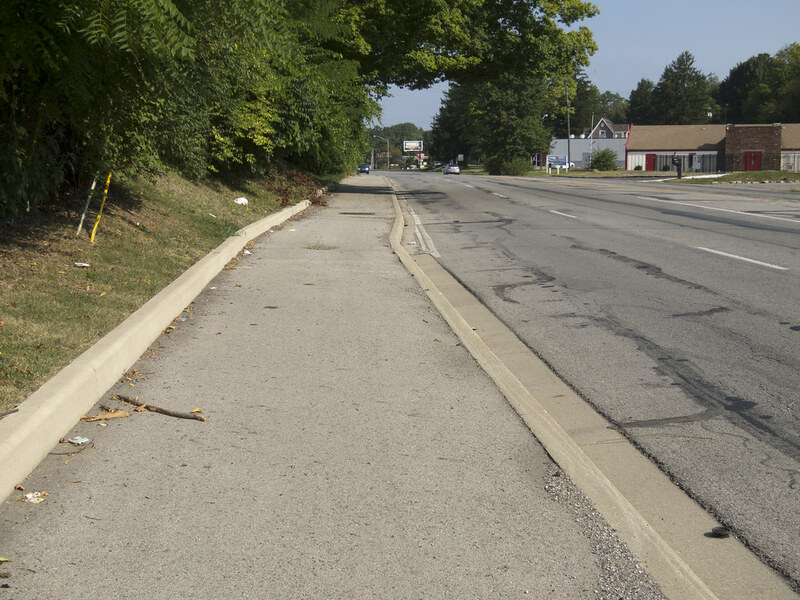 The rest of Michigan Road up to 71st or so has been badly depressed for many decades. To hear my elders describe it the profusion of public housing built in the late 60’s/ early 70s around 71st St. did it all in. I don’t know for sure about that, but even someone not from around here just driving the corridor would get the sense it fizzled out a long time ago. Where was the Burger Chef that became the BBQ? I searched quickly for it and the address I found was the lot Gillum’s was on. I don’t know how a Burger Chef would have fit on that lot! Pike township did not start to be thought of as anything other than rural – podunk until the maybe the late 80s. A drive north of 62nd St. was to venture into the sticks. One time a friend’s mom drove us along Lafayette Rd. to an errand at their church in Traders Point. I remember thinking were driving to freaking Canada. LOL. I will say though that College Park was very nice back then– bright, clean & orderly. Today, not so much obviously. I worked in College Park in the late 90s and it was just starting its decline, but was still fairly clean and orderly. Today it looks like an office park past its prime. When I got here in 1994 I moved to about 46th & High School. The 38th St. Meijer had just opened. A lot, a lot, of construction was underway. I used to attend Traders Point Church of Christ at 82nd and Lafayette. This would have been late 90s/early 00s. By then the build boom was pretty much over. Still, somehow Lafayette Road wasn’t heavily affected. I later attended a church on 52nd St. just west of Lafayette. I did a post years ago that shows how much the area changed. 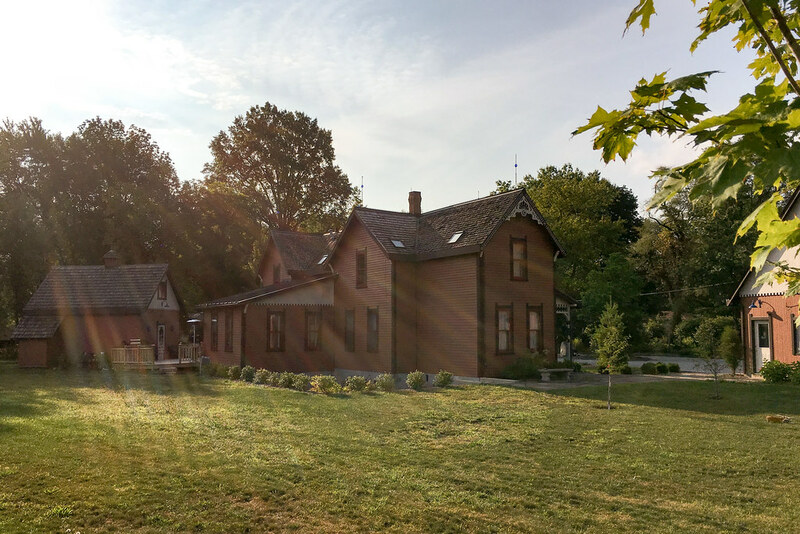 It started as a rural church, became suburban, and then became urban – before it had to sell its property because it had shrunk so much it couldn’t afford to heat and cool the place anymore. If you pull up the historical layers on map indy you can see the ex-hardees just south of where Dunkin Donuts is now. BTW at 51st and Michigan where they built a phillps 66 not long ago used to be a restaurant that was popular for high school kids to eat breakfast called the Hilltop. That would’ve been early 60s. Yes, I see it there now. Holy wow, it was still there as late as 1999. I have no memory of it whatsoever. I grew up in a small Cape Cod revival at 5609 Michigan Road that was hidden behind the tree line that used to run along the road. It was the fourth house North of the old farm house that you featured above. It has since been demolished and used to sit where the McDonald’s is now. This corner has gone through quite an evolution. In my opinion for the worst. The hardest part about seeing it now is how bare it looks without the mature canopy that was removed to build the new gas station, McDonalds, and Walmart. I was lucky to have lived there from 1993 to 2013. What a shame that your old house was razed. I lived at the 56th/Kessler/Cooper intersection from 1994 to 2017. I have to tell you, the Walmart going in was a giant improvement in my quality of life. You know that the only real shopping was up on 86th St. or down on 38th St. — being able to pop over to Walmart real quick was huge. So yes: lament the wooded area that was there. But man, the shopping that went in made life so much easier.